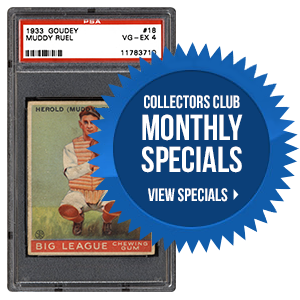 Unless you have been living under a rock somewhere, you have probably heard all about the miraculous Lucky 7 Find of T206 Ty Cobb cards in 2016. 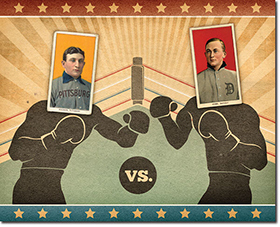 As a result of that find, PSA’s Joe Orlando thought it would be fun to pit this great rarity against the T206 Honus Wagner in a baseball card face-off. Dale Murphy is one of the most underrated stars of the 1980s. This two-time MVP (1982/1983) and five-time Gold Glove winner was one of the most well-rounded players in the game. 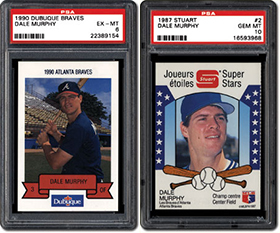 While he fell short of Hall of Fame induction, Murphy remains a popular choice with collectors. In the following piece, we take a closer look at his career in cardboard. In 1966, Philadelphia Gum produced one of the most popular football card sets ever made. 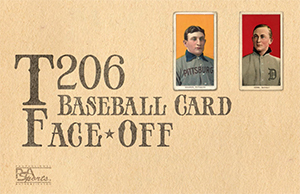 What many collectors don’t realize is that the manufacturer also produced non-sports sets during the period. This included one dedicated to the story of Tarzan, which was released that same year. 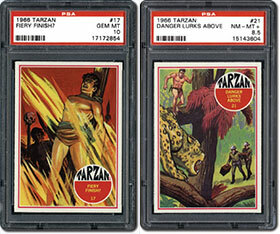 With a new Tarzan movie hitting theaters, we thought it would be a good time to revisit this colorful, 66-card set. In 10 years, how do you think the T206 Cobb’s value will compare to the T206 Wagner? The Cobb will continue to be worth much less. The Cobb will be worth less, but close the gap. The Cobb will be worth about the same as the Wagner. The Cobb will surpass the Wagner. Judging is underway and winners will be announced by the end of June. Good luck to all who are in contention and thank you for your participation in the PSA Set Registry! For more information about the PSA Set Registry awards, please click here. The annual PSA Set Registry Luncheon will be held on Friday, August 5th in Atlantic City at the National. Email invitations have been sent. Please be sure to RSVP to [email protected] no later than 7/22.